The felted ankle tab bootie pattern is finally here! Available for purchase at my Etsy shop or on Ravelry. I've been working on perfecting this pattern since I first opened my Etsy shop in May of last year. After much trial and error I think I've finally done it! These booties are rock solid, adjustable, easy for kids to get on and off, stay put thanks to the velcro closure, and what's more is that they are quick and EASY!!! 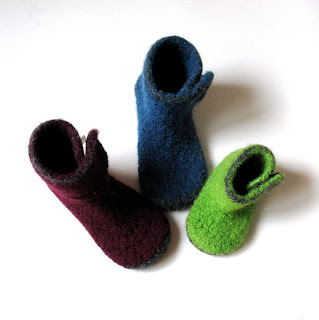 Pattern comes in 4 sizes, has detailed felting instructions (perfect for your first felting project) plus instructions on how to make the slippers non-skid. Enjoy!